Get your popcorn and pull up a comfy chair – it’s video time! This montage (if it’s good enough for Rocky, it is good enough for us) shows the process of uncovering a Roman drain. But not just any roman drain, this was a particularly fine example made of tile. The drain was truncated (partially removed) by a later stone wall, and when it was initially uncovered clean water was still flowing through it! Ok, it’s highly unlikely it was water that flowed during the Roman period, and more likely to be ground water seeping in today further along the drain, but it was still pretty exciting. The part we uncovered was completely water tight. The tiles were surrounded by a clean clay packing. Inside the drain, stuck to the underside of the tiles, was a bright orange deposit. This was formed from the minerals inside the fabric of the tile reacting with the water. We are calling this a drain, but it also possibly was a water pipe providing clean water. We have seen many timber drains on site, but none made of CBM. We estimate at the moment (pre pottery dating) this dates to the 3rd century, so could have served the area when the temple was in use. We only managed to excavate part of the drain as the rest disappeared beyond our area of excavation, so we do not know where it goes. Not only was this drain interesting for, well, being a fine example of a drain, but also for the tile it was made of. The base of the drain was constructed of a very large (and heavy) curved tile. 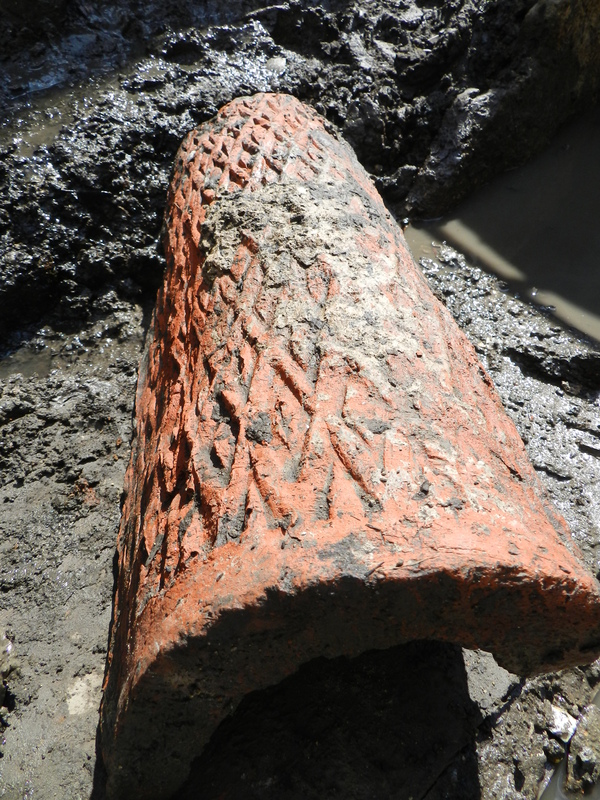 It looks very much like an imbrex (roof tile), however is much larger than most imbrex tiles; about half a meter long. When we showed it to our CBM specialist he immediately recognised it. Not because it is common, but because it is unique. There is one similar example from London known and that is in the British Museum. These tiles were made in south-west Sussex, and it is believed they were made for a specific function by a specific group of potters: for making fake columns! They would have been stacked up on top of each other and a mortar or render spread around the outer surface; this is why the outside is keyed (has a diamond pattern). This would have been a cheap way to mimic marble columns, however they could not have been load bearing. The mortar on the outside of our tile indicates it was first used in this way, and then later, when the fake column was dismantled, used as the base for the drain. Unfortunately we have no evidence for what building the tile featured in originally. Do you wonder where the water in the drain was coming from and will it now back up without the drain to channel it away? That is a good question. Water encountered in this way usually comes from one of two sources: either rain water that has found its way in through current drainage systems or has soaked in from the surface, or ground water (water that flows under the ground surface). It is likely the drain is broken higher up it’s run and water is seeping in from there. In terms of it backing up, that is a possibility. Although the amount of water flowing through it is minimal, and will just get soaked up in the surrounding ground. The contractors on site have a lot of problems with water as the excavations are very deep. Pumps and drainage systems are planned before excavation begins to prevent the water becoming a problem now or in the future.